This lawn edging log roll is quick and easy to erect. 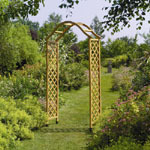 The border edging can be used on straight or curved edges. This range of log roll is available in 7 heights. 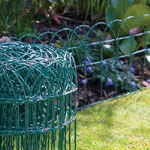 The log roll edging can be painted or stained to any colour. All our lawn edging is pressure treated and guaranteed against rot for 10 years..
Our lawn edging are made from FSC certified timber. These lawn edgings are quick and easy to put in. The log roll edging can be painted or stained. The log edging can be used on straight or curved edges. This range of lawn and garden edging is available in 7 heights. These log lawn edgings are quick and easy to put in. The log roll edging can be painted or stained. The log edging can be used on straight or curved edges. This range of lawn and garden edging is available in 7 heights. These log roll stakes are made from galvanised steel for long life. 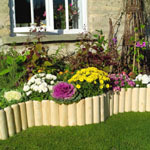 Ideal for use with log rolls up to the height of 300cm..
Picket fencing from only £5.99. Click on image to see full range of Picket Fening. 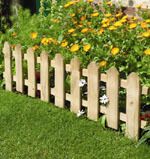 Manor Picket fence from only £5.99. Click on image to see full range of Manor Picket Fence.